Fox has once again shifted the release date for the highly-anticipated sequel to 2014's surprise hit Kingsman: The Secret Service. Though, this most recent shift in release dates should be good news for those who are excited to see Kingsman 2 because the movie will now be coming out a bit sooner than we thought. It may only be a week sooner, but sooner nonetheless. Kingsman: The Golden Circle will now be arriving in theaters on September 29. Exhibitor Relations broke the news on Twitter that Fox had decided to bump up the release date for Kingsman 2 by a week, shifting the sequel from its October 6 release date. That date would have put it in direct competition with Denis Villeneuve's Blade Runner 2049, which could wind up being a big hit and it most definitely has people talking. This is not the first time that Kingsman 2 has had its release date moved as it was originally slated to come out on June 16, 2017. Fox decided to push it back to October after doing some schedule tweaking and now it has shifted yet again. This new release date will at least give Kingsman: The Golden Circle one, mostly free and clear, weekend at the box office. Here is what Exhibitor Relations had to say about the release date shift. "Fox's Kingsman: The Golden Circle has been bumped up a week--the sequel will now open 9/29/17 instead of 10/6." As of right now, there are no major releases coming out on September 29 that will get in the way of Kingsman: The Golden Circle being able to dominate at least its first weekend of release. The prior weekend will see the release of The LEGO Ninjago Movie which should probably do well but won't likely get in the way of the Kingsman sequel doing well. Kingsman: The Secret Service made $414 million worldwide but had very strong word of mouth and caught a lot of people by surprise. Kingsman 2 seems like a sequel that is poised to outperform its predecessor. At the very least it would seem hard to imagine that the sequel, unless it turns out to not be any good, will make less money than the first Kingsman did. Getting at least one weekend without any major, direct competition is a step in the right direction. We still haven't seen a trailer for The Golden Circle yet, but we do know that this movie is going to be quite a bit different. The movie will be partially set in America and will see the Kingsman teaming up with their American counterparts. 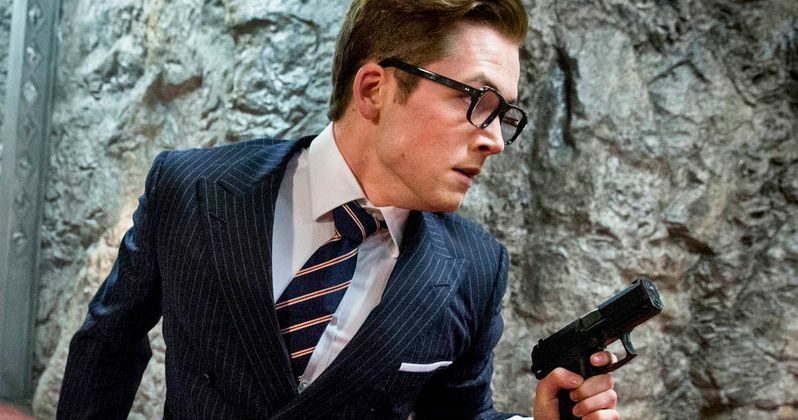 Star Taron Egerton has also said that the movie will not be for the "faint of heart" and will live up to its R-rating. Matthew Vaughn has been making solid R-rated comic book movies for a long time now, long before Deadpool and Logan came about, so that shouldn't be all that surprising. That makes the rumors that he may be directing Man of Steel 2 all the more interesting, but before that happens we are at least getting one more insane, violent spy movie from him. Kingsman 2 stars Taron Egerton, Mark Strong, Colin Firth, Sophie Cookson, Pedro Pascal, Channing Tatum, Julianne Moore, Jeff Bridges, Halle Berry and Elton John. The movie was directed by Matthew Vaughn, who co-wrote the script with Jane Goldman. Kingsman: The Golden Circle is now set to hit theaters on September 29. Fox's KINGSMAN: THE GOLDEN CIRCLE has been bumped up a week--the sequel will now open 9/29/17 instead of 10/6.